Arthur C. Nielsen (born as Arthur Charles Nielsen, Sr. in Chicago, Illinois, died in Chicago, Illinois) was a famous Businessman from USA, who lived between September 5, 1897 and June 1, 1980. He became 82 years old. 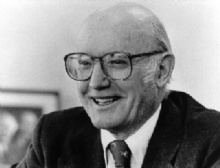 Arthur Charles Nielsen, Sr. was an American marketing researcher. 1923 Arthur Charles Nielsen founded in Evanston, Illinois, the ACNielsen Corp, A company for market research, since he had seen as one of the first, that movements in the market and changes can be analyzed and systematized in the opinion, the market opportunities for goods and services to improve. Among other innovations in consumer, the method used to date the retail panel, the data collection is at the point of sale, the place of purchase act. Arthur C. Nielsen, is the creator of the Nielsen television ratings, and developed the concept of "market share", one of the most important marketing figures today. Nielsen studied at the University of Wisconsin (University of Wisconsin at Madison) and was captain from 1916 to 1918 the university tennis team. Later, he remained true to the sport of tennis, along with his son, Arthur C. Nielsen Jr., he won the U.S. Championships in the father-and-son double in 1946 and 1948. He was elected in 1971 in the International Hall of Fame tennis. The University of Wisconsin in 1974 appointed him an honorary doctorate. Nielsen married in 1918 Gertrude B. Smith, he has a son Arthur C. Nielsen, Jr. and three grandchildren (Dr. Arthur C. Nielsen III, Christopher J. and Elizabeth Nielsen Nielsen Cocciarelli). He is born under the zodiac virgo, who is known for Analyzing, Practical, Reflective, Observation, Thoughtful. Our collection contains 7 quotes who is written / told by Arthur. "Watch every detail that affects the accuracy of your work"
"Keep the problems of clients and prospects confidential. Divulge information only with their consent"
"Accept business only at a price permitting thoroughness. Then do a thorough job, regardless of cost to us"
"Leave no stone unturned to help your clients realize maximum profits from their investment"
"Be influenced by nothing but your clients' interests. Tell them the truth"
"Employ every economy consistent with thoroughness, accuracy and reliability"
"Give your clients the earliest delivery consistent with quality - whatever the inconvenience to us"